I would describe my visit to Sravasti Abbey for a weekend retreat as much needed nourishment along the path of life. Every now and then these all too brief but exquisite moments in time happen when we meet with like-minded people open to an experience of learning. What may seem to be a random meeting of people who have never met becomes one of these fortunate times when something is shared. The Abbey itself rests in a beautifully spacious and forested setting with views of the surrounding mountains, but is also homey and comfy. The flower gardens and guest accommodations were so nice. I especially enjoyed the hummingbirds, the wild turkeys, and the raucous calls of coyotes that we heard nearby one night. The Meditation Hall is also very beautiful, with the large golden Buddha statue and many smaller Buddhas. More than all of this was the preciousness of the people. Immediately on my arrival I felt safe and cared for. This feeling endured throughout the retreat — I think for the other retreat-goers, too. We were fortunate to learn from teachings of Venerable Chodron, as well as each resident nun in such a restful, gracious, and accepting atmosphere. 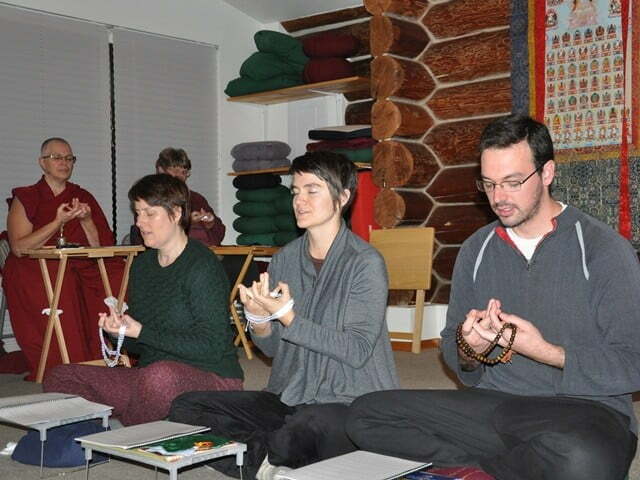 All the teachings were helpful and down-to-earth. What a benefit to be able to discuss and meditate on all those thorny life issues in such a safe and contemplative environment. The nuns and those in training clearly took great care to organize our schedules so that we knew where to be and what was expected, and that in any case, everything was okay. I really felt comfortable there the entire time. This is not such an easy thing to achieve with a diverse group of people brought together for a single event, but Sravasti Abbey has that energy. These teachers are a unique group of people, and I can still see clearly each one of their kind faces. I hope this will encourage others to visit.